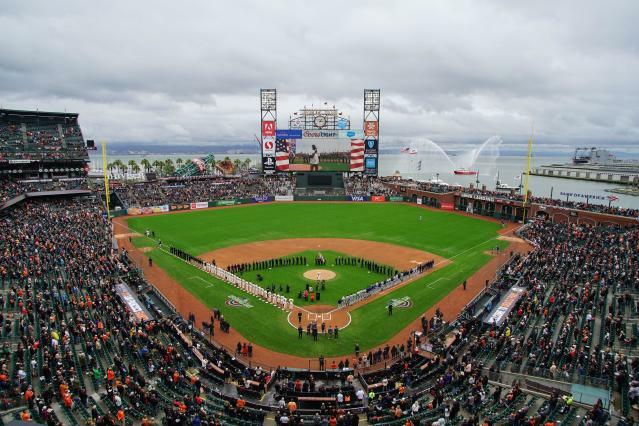 Some big changes are reportedly being reconsidered for Oracle Park, home of the San Francisco Giants. During the offseason, the team created a stir by renaming their home of 19 years. Now comes word that acting Giants CEO Rob Dean and new president​ Farhan​ Zaidi have discussed the possibility of changes to the field's layout. Changes that would be aimed at making the ballpark livelier for the fans and safer for the players. According to The Athletic's Andrew Baggarly and Eno Sarris, those changes would include moving the right-center field fences in. That move would eliminate Triple's Alley, which has been a staple since the ballpark opened in 2000 and is among the most unique features in Major League Baseball. Dean is also reportedly a proponent of moving the home and visiting bullpens, which were awkwardly placed along the first and third-base foul lines. One potential spot for the bullpens would be the area vacated by Triple's Alley. Zaidi tells The Athletic the discussed changes are a "long way from having real traction and momentum.” The story notes that CEO Larry Baer, who’s currently serving a suspension following a public altercation with his wife, has been against making changes in the past. Baer will have a big say in any potential changes once he returns in July. The concern from a baseball and team-building perspective is that Oracle Park’s dimensions have become too much of an outlier. Zaidi believes that could become a disadvantage in terms of evaluating his players and building the team. "Objectively, how would it impact the type of game played in our park? We’d want to look at how it would affect us organizationally now and going forward. But at this point, for practical issues like the bullpens or broader long-range philosophical or strategic issues about where the game is going, I think we’re at least opening up the discussion on it." There are other factors in play too. The team wants to make sure fans are seeing an exciting product on par with other ballparks around the league. And they also want to eliminate potential hazards for the players. According to The Athletic report, there have been 300 fewer home runs hit at Oracle Park than any other ballpark since it opened. The gap would be even larger without Barry Bonds’ 160 home runs there. Of course, that wasn’t much of a concern when the Giants were winning three championships. But it is now with the team struggling and attendance declining. One detriment is the weather. The average game temperature on the shores of McCovey Cove is traditionally the coldest in MLB. But that's something the Giants can't control. What they can control are the ballpark's dimensions. Right now, it's 421 feet to the wall in right-center field. On top of that, there's a 25-foot high wall that's knocked down hundreds of would-be homers. Moving the fences in and eliminating that wall would instantly make Oracle Park a more hitter-friendly ballpark, and would certainly liven up the games with more offense. The Giants are one of just three teams in MLB, along with the Oakland A’s and Tampa Bay Rays, to have their bullpens located on the field in foul territory. Teams have moved away from that setup in part to add more seating that's close to the field. But they've also done so to eliminate a potential hazard for players. The Giants saw firsthand how dangerous it can be when outfielder Mac Williamson tripped over the left field bullpen mound while attempting to retrieve a foul ball last season and ended up sustaining a concussion. Several Giants players have since spoken out on the danger created by having the bullpens so close to field, including Buster Posey and Brandon Belt. Rob Dean cited Williamson’s injury as an eye-opener. With key members of the front office now joining the players in calling for changes, perhaps Giants ownership will be moved to get on board as well.